With the release of his upcoming biography 'Hello Me ... Meet the Real Me,' Megadeth frontman Dave Mustaine hopes readers will gain a better understanding of his turbulent past and develop a new appreciation for the man who has, at times, been one of the most crucified figures in metal. "It's easy to hate somebody that you don't like," he tells Noisecreep. "But you know what? People don't know who I am. Who they think I am is not really who I am, because they guy that they've continued to vilify in the press, that guy's been gone a long time. And I think anyone who reads this book will see that." 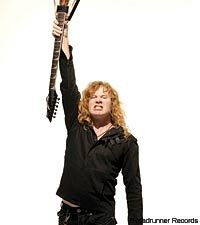 Mustaine worked on his book for much of the last year with co-writer Joe Layden, who also wrote 'The Last Great Fight,' about the legendary 1990 boxing match between James 'Buster' Douglas and Mike Tyson, in which Douglas scored a tenth-round knockout. The book is tentatively scheduled for release in late 2010. Like many musician autobiographies, "Hello Me ... Meet the Real Me" provides an honest, confessional perspective on life on the road and in the spotlight. But unlike some, it's not simply a tell-all story of decadence and debauchery. "That stuff is mundane," Mustaine says. "We come to expect that from rock stars, so why would I talk about it? Everybody knows it happened. I want to talk about things that are way more important. There's stuff in there about how the band was formed, why I chose to sing, how the different band members came and went, how different songs were written, stuff that happened through the addictions and rehabs. And when I got done reading it for the first time, when I closed the last page I actually had tears in my eyes because somebody had finally gotten who I am as a person in print." When pressed for details, Mustaine explains how there will be a section about how former bassist Dave Ellefson put the brakes on the band's forward momentum right when Megadeth were at their prime. "You know, we canceled seven Monsters of Rock shows in soccer stadiums. Why? Because Dave Ellefson ran out of heroin," Mustaine says. "When I ran out, I would tough it out. I'd be sick for a couple days, I'd drink some Jack Daniels and I'd be over it. He came up with some excuse that he sprained his wrist in the shower and the tour ended. So did our run for a long time. We took the gnarliest hit to our credibility." Another part of the book reveals how Mustaine practiced black magic as a teenager, and how the experience -- which inspired the 1986 song 'The Conjuring' -- affected his life for years after. "I put two hexes on people, and they both worked and the result was just what I was asking for," he explains. "Now, it took forever to get that Satanic depression off of me because it's just like playing with a Ouija board. You open the doorway to the dark side, and spirits come through. It took almost 20 years to get rid of that Satanic depression. I did it when I was 15, and I don't think I got free of it until I was in my mid 30s.You ask yourself, 'How is it possible that this is happening to me?' Well, because you flirted with the devil and you put a hex on somebody and you put another hex on somebody, and, well, you owe him. And that's why I have a problem playing 'The Conjuring' today."